Leonardo Bonucci (Italian pronunciation: [leoˈnardo boˈnuttʃi]; born 1 May 1987) is an Italian professional footballer who plays as a centre-back for Serie A club Juventus and the Italy national team. After beginning his career with Inter Milan in 2005, Bonucci spent the next few seasons on loan at Treviso and Pisa, before moving to Bari in 2009. His technique, ball-playing ability and defensive performances alongside fellow Italian centre-back Andrea Ranocchia earned him a move to Juventus the following season, where he later became a key member of the club's three-man defensive line, alongside Giorgio Chiellini and Andrea Barzagli, establishing himself as one of the best defenders in world football. He went on to win six consecutive Serie A titles with the team between 2012 and 2017. In 2017, he moved to A.C. Milan, and one season later returned to Juventus. At international level, Bonucci has represented Italy at two FIFA World Cups (2010 and 2014), two European Championships (2012 and 2016), and a FIFA Confederations Cup (2013), winning a runners-up medal at Euro 2012, and a third-place medal at the 2013 FIFA Confederations Cup. Bonucci has also won several individual honours for his performances: he was named to the UEFA Europa League Squad of the season during the 2013–14 and 2017–18 seasons, and is a three-time member of the Serie A Team of the Year. He was named the Serie A Footballer of the Year in 2016, and was also included in the UEFA Team of the Year in the same season. In 2017, he was also included in the FIFA FIFPro World XI and the IFFHS Men's World Team, as well as the 2016–17 UEFA Champions League Team of the Season and the 2016–17 ESM Team of the Year. Bonucci started his career in the youth ranks of his hometown club Viterbese but was loaned to Inter Milan in the summer of 2005. He played a number of pre-season friendlies for the Inter first team. He then became a member of the Inter U20 team. On 14 May 2006, Bonucci made his Serie A debut in the last match of the 2005–06 season, in a 2–2 away draw against Cagliari, which was Inter's 3,500th competitive match. On 7 July 2006, Inter bought Bonucci outright. He played his first Coppa Italia match against Messina on 9 November 2006 when he came off the bench for Fabio Grosso in the 86th minute. Bonucci featured in two more Coppa Italia games for Inter that season when he was brought on for the substituted Walter Samuel at half-time during the quarter final second leg match against Empoli, and as a starter in the semi final second leg tie against Sampdoria. In January 2007, Inter sold 50% of Bonucci's registration rights to Treviso, along with 50% of the registration rights for fellow Primavera team-mate Daniel Maa Boumsong. At that time Bonucci was tagged for a peppercorn fee of €500. Bonucci subsequently remained at Inter until 30 June 2007 while Maa Boumsong returned from Treviso where he spent the first half of the season on loan. During Bonucci's last season with the Inter's youth side, he won the Campionato Nazionale Primavera (the national youth league title). On 1 July 2007, Bonucci and Maa Boumsong formally became players of Treviso after their loan contract back to Inter had expired, as well as the renewal of the co-ownerships in June 2007. At Treviso, Bonucci made 20 starts in 27 Serie B appearances as one of the regular starters. In June 2008, among the other Inter youth products, Bonucci was the only player that was bought back from Treviso. However, he was loaned back to Treviso for the 2008–09 season. According to a Treviso filing named Tabella N°5 – circolare Co.Vi.So.C. prot. N°4051.4/GC/pc del 11 maggio 2005 in their 2007–08 financial report, Bonucci was sold for a €700,000 fee. Bonucci played 13 Serie B matches for Treviso before leaving for another Serie B struggler Pisa on loan. On 8 June 2009, Bonucci underwent a medical examination at Genoa. On 1 July, Inter officially announced that Bonucci, along with Acquafresca, Bolzoni and Meggiorini had been transferred to Genoa, as part of the deal that sent Diego Milito and Thiago Motta to Inter. Moreover, Ivan Fatić who was co-contracted ("co-owned") between Chievo and Inter, became co-contracted between Chievo and Genoa instead, according to a news article by La Gazzetta dello Sport. Bonucci was valued at €3 million at that time. On 2 July he was transferred to Bari from Genoa, on a co-ownership deal, for €1.75 million, along with Meggiorini (also on a co-ownership deal), Matteo Paro (on loan), Andrea Ranocchia (on loan) and Giuseppe Greco (on loan). At Bari he became a first team player in central defence under head coach Gian Piero Ventura, showing a composed yet strong and effective defensive playing style. He formed an extremely strong defensive partnership with Andrea Ranocchia which was so effective that, as of the midway point in the 2009–10 season, Bari had the second best defensive record in Serie A. The strong partnership ended after Ranocchia got injured half-way through the season and was ruled out for the remaining fixtures. On 1 July 2010, Bonucci was signed by Juventus on a four-year contract for a total of €15.5 million fee from Bari; Bari bought Bonucci from Genoa outright for €8 million. However, Genoa and Bari used part of the transfer receivables to sign the remaining 50% registration rights of Domenico Criscito and 50% of the registration rights of Sergio Bernardo Almirón from Juventus. Bonucci was assigned the shirt number 19. Partnered with Italy teammate Giorgio Chiellini in defence, Bonucci was immediately drafted into the starting line-up for the first matches of the season. He scored his first goal for Juventus in the Europa League play-off match against Sturm Graz. The following season, due to the presence of veteran of Andrea Barzagli, it was expected that Bonucci would compete with him for a starting place alongside Chiellini in a four-man defence, as the club's new manager Antonio Conte was known for his preference for the 4–2–4 formation, a variant upon the 4–4–2 formation. However, after experimenting with several tactical systems, Conte eventually decided to play all three players in a three-man defence aided by wingbacks in a 3–5–2 formation, and Bonucci established himself once again in the starting eleven alongside Chiellini and Barzagli. Due to their performances together, the three-man defence earned the nickname BBC, a reference to the players' initials. Soon, the trio established themselves as one of the best defences in world football during the following seasons. On 2 April 2012 Juventus announced that he had signed a new 5-year contract effective on 1 July 2012. Bonucci won his first major title, the 2011–12 Scudetto, and contributed two goals as Juventus finished the season undefeated and with one of the best defensive records in the top five European leagues. His good form that season earned him a place in the final UEFA Euro 2012 squad. Bonucci began the season by winning the 2012 Supercoppa Italiana with Juventus. He made his Champions League debut against Chelsea in the group stage and scored his first goal in the competition against Shaktar Donetsk on October 2012 in a 1–1 draw. On December 2012 Bonucci was criticized for diving in a league game against Palermo on which was described by a number of journalists as "the worst dive ever". He was booked by the referee during the game and subsequently given a one-match ban and a €2000 fine by the authorities. Juventus finished the season by winning the 2012–13 Serie A title. The following season, Bonucci would help Juventus to defend the Supercoppa Italiana and the Serie A title, although Juventus would suffer a group-stage elimination in the UEFA Champions League. Nevertheless, he helped Juventus to reach the semi-finals of the Europa League, scoring a decisive goal against Lyon in the quarter-finals. During the 2014–15 season, Bonucci made his 200th appearance with Juventus on 25 January 2015, in a 2–0 win over Chievo. On 6 June 2015, Bonucci started for Juventus in the 2015 UEFA Champions League Final, but were defeated 3–1 by Barcelona at Berlin's Olympiastadion. With 52 appearances, he made the most appearances for Juventus that season across all competitions, along with team-mates Claudio Marchisio and Roberto Pereyra. On 24 November 2015, Bonucci was nominated for the 2015 UEFA Team of the Year. On 2 March 2016, he captained Juventus in the absence of Gianluigi Buffon and Chiellini, scoring the decisive penalty in the resulting shoot-out of the second leg of the Coppa Italia semi-finals against Inter, at the San Siro, following a 3–3 draw on aggregate, which allowed Juventus to progress to the final; however, due to the yellow card he received during the match, and having already been booked prior to the fixture, he missed the victorious final against Milan, which saw Juventus capture a domestic double for the second consecutive season, including a record fifth consecutive league title. During the beginning of the 2016–17 season, Bonucci dedicated time to his ill son Matteo, missing select matches with Juventus and the national team. On 27 November, Bonucci suffered a severe thigh strain in an eventual 3–1 away loss to Genoa, sidelining him for up to 60 days. On 19 December, Bonucci penned a new deal with Juventus, keeping him at the club until 2021. On 5 January 2017, Bonucci was named to the 2016 UEFA Team of the Year. On 30 January, Bonucci was named to the 2015–16 Serie A Team of the Year, and was also named the 2016 Serie A Footballer of the Year. Bonucci made his 300th Juventus appearance in a 4–1 home win over Palermo on 17 February; however, after Palermo scored a late goal, Bonucci had an argument on the touchline with coach Massimiliano Allegri, causing the club to fine and omit him from the squad for the first Champions League round of 16 leg with Porto on 22 February. On 17 May, Bonucci scored the last goal of a 2–0 win in the final of the 2016–17 Coppa Italia over Lazio. On 3 June, Bonucci started in a second Champions League Final in three years, but were defeated 4–1 by defending champions Real Madrid. On 5 June, he was subsequently named to the UEFA Champions League squad of the season. On 14 July 2017, Bonucci was signed by A.C. Milan on a five-year contract for a €42 million fee. On 4 August 2017, Bonucci was named one of the three finalists for the Defender of the 2016–17 UEFA Champions League season award. Milan's manager Vincenzo Montella subsequently named Bonucci as the team's new captain later that month. On 23 October, he was named to the 2017 FIFA FIFPro World11. Although much was expected of Bonucci and Milan, the first half of the 2017–18 season was disappointing both for him and the club, and he drew criticism in the media over the quality of his performances. He scored his first goal for Milan on 6 January 2018, in a 1–0 home win over Crotone. On 31 March, Bonucci scored the equalising goal against his former team away to Juventus, breaking goalkeeper Gianluigi Buffon's record of longest consecutive minutes not conceded in an eventual 3–1 defeat. On 2 August 2018, Bonucci returned to Juventus as part of a swap deal with A.C. Milan involving Mattia Caldara; both Bonucci and Caldara were tagged for €35 million transfer fee. He signed a five-year contract until 30 June 2023. Bonucci made his return for Juventus in their opening Serie A match on 18 August, a 3–2 away win over Chievo, contributing to Juventus's temporary equaliser, an own goal by Mattia Bani. On 29 September 2018, Bonucci scored his first goal for Juventus since his return from Milan, the final goal of a 3–1 home win over Napoli. On 2 October, he made his 50th Champions League appearance in a 3–0 home win over Young Boys. On 2 April 2019, Bonucci marked his 250th Serie A appearance with Juventus by scoring the opening goal in a 2–0 away win against Cagliari. However, following the match, he was heavily criticised after stating that Kean was partly to blame by his celebration which caused further jeers, by England international Raheem Sterling who deemed the comments 'laughable', compatriot Mario Balotelli, English singer Stormzy, and former Juventus player Paul Pogba. Bonucci implied that Kean's celebration caused further jeers, stating to Sky Sport Italia: "Kean knows that when he scores a goal, he has to focus on celebrating with his teammates. He knows he could've done something differently too. There were racist jeers after the goal, Blaise heard it and was angered. I think the blame is 50–50, because Moise shouldn't have done that and the Curva should not have reacted that way. We are professionals, we have to set the example and not provoke anyone." Later, he made a post on Instagram which read "Regardless of everything, in any case... no to racism." In response to the criticism, the following day, Bonucci posted on Instagram: "After 24 hours I want to clarify my feelings. Yesterday I was interviewed right at the end of the game, and my words have been clearly misunderstood, probably because I was too hasty in the way I expressed my thoughts. Hours and years wouldn't be enough to talk about this topic. I firmly condemn all forms of racism and discrimination. The abuses are not acceptable at all and this must not be misunderstood." At youth level, Bonucci played for the Italy national under-21 football B team. He was called-up for a friendlies against Renate on 6 November 2007, and against the Under-20 Serie C representative team on 4 December 2007. He was also capped for the team in an internal friendly, which split the Under-21 Serie B team into two on 9 October 2007, on 21 October 2008, on 25 November, and on 24 March 2009, as team captain. He also received a call-up from the Italy U20 team on 31 May 2007. He was an unused substitute in the 0–1 loss to the Serie D Best XI. 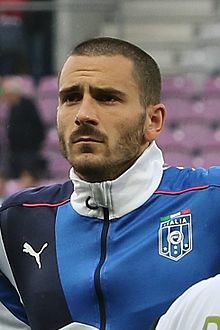 Bonucci made his debut with the Italy senior team on 3 March 2010, under manager Marcello Lippi, in a friendly match against Cameroon played in Monaco, which ended in a 0–0 draw, and became one of the few debutants to have never played an official match for the national youth teams. He was included by manager Marcello Lippi in the starting line-up along with national team regulars Fabio Cannavaro and Giorgio Chiellini, forming a three-man defensive line in Lippi's 3–4–3 formation. Due to his performances during the 2009–10 season, Bonucci was included in the Italy squad for the 2010 FIFA World Cup. He scored his international first goal on 3 June 2010, in a 1–2 friendly loss against Mexico, in a pre-tournament friendly match. In the World Cup, he appeared as an unused substitute for all three of Italy's matches, as they suffered a first-round elimination, failing to win a match. Bonucci ended a fine 2011–12 season by earning a place in the final 23-man Italy squad for UEFA Euro 2012, under manager Cesare Prandelli, helping Italy to reach the final of the tournament, where they were defeated 4–0 by defending champions Spain. He started in all but one match as Italy reached the finals. In the 2013 FIFA Confederations Cup he missed his spot-kick in the penalty shoot-out against Spain in the semi-finals, shooting high over the bar as Italy went out of the competition losing 7–6 on penalties; Italy would win the bronze medal match over Uruguay 4–3 on penalties, after a 2–2 draw following extra-time, allowing them to capture third place. Bonucci was selected by Cesare Prandelli to be part of the Italy squad that would take part at the 2014 FIFA World Cup in Brazil, although he once again remained an unused substitute, as they were eliminated in the first round of the competition for a second consecutive time. On 4 September 2014, under new Italy manager Antonio Conte, Bonucci wore the captain's armband for Italy for the first time, following Daniele De Rossi's substitution in a 2–0 friendly win over the Netherlands. On 31 May 2016, Bonucci was named to Conte's 23-man Italy squad for UEFA Euro 2016. On 13 June he set up Emanuele Giaccherini's goal, Italy's first of the match, with a long ball in a 2–0 win over Belgium in the opening group match of Euro 2016; he was later booked for a tactical foul. After helping Italy to another clean-sheet in a 1–0 victory in the second group match against Sweden on 17 June, Bonucci was once again praised for his defensive performances alongside Chiellini and Barzagli. On 22 June, he captained Italy in Buffon's absence in his nation's final group match, a 1–0 defeat to Ireland. On 27 June he produced a Man of the Match performance in the round of 16 of the tournament as he helped Italy to keep a third clean sheet and defeat defending champions Spain 2–0. In the quarter-final fixture against Germany on 2 July, he scored Italy's equalising goal from a penalty, although his spot-kick was saved by Manuel Neuer in the resulting shoot-out, as the reigning World Cup champions advanced to the semi-finals following a 6–5 shoot-out victory. A former midfielder who is usually deployed as ball-playing centre-back in a three-man defence (although he is also capable of playing in a four-man defence, both in the centre or out wide), Bonucci is primarily known for his technique, passing range, and his ability to launch an attack from the back with long passes. Although he is not the quickest player over short distances, he is a tall, mobile, and strong defender, with a good positional sense, as well as good anticipation, solid tackling, and an ability to read the game and mark opponents, on top of his ball skills; he also excels in the air, and frequently poses a goal threat from set pieces. Although he was considered to be a talented and promising young defender, he was also criticised by certain pundits for being inconsistent and prone to errors or lapses in concentration in his youth, which were dubbed "Bonucciate" in the Italian media; however, he showed notable improvements during the 2014–15 season, and established himself as one of the best defenders in world football, also drawing praise from manager Pep Guardiola, who described Bonucci as one of his "favourite ever players". His unique playing style has led Giovanni Galli to compare him to former sweeper Gaetano Scirea. In 2012, The Guardian named him the 88th Best Player in the World. In 2016, his defensive attributes, as well as his skill on the ball, vision, and accurate passing, moved La Repubblica to dub him as “Beckenbonucci”, a reference to former German sweeper Franz Beckenbauer. In addition to his defensive, playmaking and technical skills, Bonucci has also been praised for his leadership. "For three or four months, my head was just not in the right place, it’s the head that gets the legs moving. For around 15 days after the surgery, until I started to see him improving, I was just not interested in training or anything to do with football. I've always hated hospitals and tried to avoid them, but at that time I had to be there and I was really struggling to be calm. Matteo is much better now and our family feels more united than ever. Yes, I thought about quitting. Football was just not my priority at that moment. You see your son with so much to live for, he’s asking you so many questions and why this is happening to him... and I had no answers. Priorities change at those times. Now I tell myself that I am lucky. Everything I have done has been from the heart." Bonucci's older brother, Riccardo (b. November 1982), was also a footballer who once played as a central defender in Serie C1 with Viterbese. Their father owns a paint shop in Viterbo. In May 2012, during the 2011–12 Italian football scandal investigations, Bonucci, along with Juventus teammate Simone Pepe and manager Antonio Conte, as well as many other players, were accused of match-fixing; Bonucci was accused of helping to fix the result of a 3–3 draw against Udinese in May 2010, during his time with Bari, and faced a potential three-and-a-half year ban if found guilty. Bonucci denied any wrongdoing, however, and both he and Pepe were later acquitted in August later that year. In October 2012, Bonucci and his wife and then five-month-old son were confronted by an armed robber who demanded the defender to hand over his watch. As the robber reached out to take the watch, Bonucci reportedly punched him and chased him down the street. The robber escaped with his accomplice on a motorbike. As of match played on 7 September 2018. Italy score listed first, score column indicates score after each Bonucci goal. ^ "Leonardo Bonucci" (in German). German Football Association. Retrieved 7 March 2019. ^ "UEFA Champions League - Juventus - Leonardo Bonucci". UEFA.com. March 2019. Retrieved 7 March 2019. ^ "Serie A: Pass and press is secret of Juve's success". Retrieved 3 January 2013. ^ "Leonardo Bonucci's Evolution as a Leader Key for Italy in Euro 2016". Retrieved 2 June 2016. ^ "Leonardo Bonucci". Retrieved 20 November 2018. ^ "INTER'S SUMMER TRANSFERS: 62 DEALS DONE". inter.it. F.C. Internazionale Milano. 31 August 2005. Retrieved 3 June 2010. ^ "INTER 3 BOLZANO 0". inter.it. F.C. Internazionale Milano. 21 July 2005. Retrieved 2010-06-03. ^ "INTER BEAT LEICESTER 2–1". inter.it. F.C. Internazionale Milano. 25 July 2005. Retrieved 3 June 2010. ^ "INTER BEAT CRYSTAL PALACE 2–0". inter.it. F.C. Internazionale Milano. 27 July 2005. Retrieved 3 June 2010. ^ "CHOUTOS, MARTINS GOALS SINK NORWICH". inter.it. F.C. Internazionale Milano. 29 July 2005. Retrieved 3 June 2010. ^ "PARMA-INTER: 5 YOUNGSTERS WITH SQUAD". inter.it. F.C. Internazionale Milano. 29 November 2005. Retrieved 3 June 2010. ^ "INTER HOLD CAGLIARI TO DRAW". inter.it (Press release). F.C. Internazionale Milano. 14 May 2006. ^ "GERMINALE, ALOE & BONUCCI ON DEBUTS". inter.it (Press release). F.C. Internazionale Milano. 14 May 2006. ^ "BONUCCI SIGNS PERMANENT CONTRACT". inter.it. F.C. Internazionale Milano. 2006-07-07. Retrieved 2010-02-28. ^ "TRANSFERS: INTER'S JANUARY DEALINGS". inter.it. F.C. Internazionale Milano. 31 January 2007. Retrieved 2010-02-28. ^ "Giocatori" [2007–08 Profile]. La Gazzetta dello Sport (in Italian). RCS MediaGroup. Retrieved 15 July 2017. ^ "Transfer market: co-ownership deals". inter.it. F.C. Internazionale. 25 June 2008. Retrieved 2010-02-28. ^ "Academy ins and outs". inter.it. F.C. Internazionale Milano. 2 February 2009. Retrieved 2010-02-28. ^ "BONUCCI: "IL GENOA? GRANDE OCCASIONE"". genoacfc.it (Press release) (in Italian). Genoa C.F.C. 8 June 2009. Archived from the original on 11 June 2009. Retrieved 15 July 2017. ^ a b c d "Thiago Motta signs on". inter.it (Press release). F.C. Internazionale. 1 July 2007. Retrieved 15 July 2017. ^ a b "Diego Milito signs for Inter". inter.it. F.C. Internazionale. August 2010. Retrieved 30 June 2009. ^ "Il Genoa in rima: con Pelé c' è Dembelé" [Genoa rhymes: with Pelé comes Dembelé]. La Gazzetta dello Sport (in Italian). RCS MediaGroup. 10 June 2009. Retrieved 21 December 2010. ^ a b Genoa C.F.C. S.p.A. bilancio al 31 dicembre 2009 [Genoa C.F.C. S.p.A. financial report and accounts on 31 December 2009] (PDF)|format= requires |url= (help) (in Italian). Genoa: Italian C.C.I.A.A. 2010. ^ F.C. Internazionale Milano S.p.A. bilancio ordinario d'esercizio data chiusura esercizio 30/06/2010 [F.C. Internazionale Milano S.p.A. financial report and account) on 30 June 2010] (PDF)|format= requires |url= (help) (in Italian). MIlan: Italian C.C.I.A.A. 2010. ^ "Agreement with A.S. Bari for the acquisition of the registration rights of the player Leonardo Bonucci" (PDF) (Press release). Turin: Juventus F.C. 1 July 2010. Retrieved 10 May 2018. ^ "Bonucci riscattato dal Bari" (Press release) (in Italian). A.S. Bari. 24 June 2010. Archived from the original on 29 June 2010. Retrieved 24 June 2010. ^ "Agreements with Genoa C.F.C. S.p.A." (PDF) (Press release). Turin: Juventus F.C. 25 June 2010. Retrieved 10 October 2018. ^ "Agreement with A.S. Bari for the disposal of the player Sergio Bernardo Almiron" (PDF) (Press release). Turin: Juventus F.C. 14 July 2010. Retrieved 10 October 2018. ^ Bramardo, Francesco (24 December 2010). Written at Turin. "Bonucci non si ferma mai Nel 2010 sempre in campo". La Gazzetta dello Sport (in Italian). Milan: RCS MediaGroup. ^ "Europa League 2011 Sturm-Juventus". UEFA.com. 19 August 2010. ^ a b "Euro 2012: Juventus renaissance transforms Cesare Prandelli's Italy". The Guardian. 27 June 2012. ^ "'Italy defence world's best'". Football Italia. 20 June 2016. Retrieved 3 July 2016. ^ "Morata: Italy have best defence". Football España. 25 June 2016. Retrieved 3 July 2016. ^ "Bonucci and Matri sign contract extensions". Juventus FC. 2 April 2012. Retrieved 4 April 2012. ^ "Champions League 2012 Juventus-Shaktar Donetsk". uefa.com. 2 October 2012. ^ "Is this the most embarrassing dive ever? Juventus cheat Bonucci leaves Cazorla and co in the shade". Daily Mail. 11 December 2012. ^ "Today on YouTube: Juventus striker Leonardo Bonucci guilty of the worst dive ever?". Daily Telegraph. 11 December 2012. ^ "Simulazione, multato Bonucci". La Stampa. 11 December 2012. ^ Riccardo Pratesi (3 April 2014). "Europa League: Lione-Juventus 0–1: risolve Bonucci nel finale, infortunio a Tevez" [Europa League: Lyon-Juventus 0–1: Bonucci decides it in the end]. gazzetta.it (in Italian). La Gazzetta dello Sport. Retrieved 27 April 2015. ^ Camillo Demichelis (26 January 2015). "BONUCCI: "Orgoglioso delle 200 presenze in bianconero. Ora si guarda avanti con fame di altri successi"" [BONUCCI: "Proud of my 200 appearances with Juventus. Now I'm looking aheard with hunger for more successes"]. tuttojuve.com (in Italian). Retrieved 27 April 2015. ^ Paul Sumeet (24 November 2015). "Six Juventus stars nominated for UEFA Team of the Year". La Gazzetta dello Sport. Retrieved 26 November 2015. ^ Matteo Brega (2 March 2016). "Inter-Juve 3-0, ma i rigori premiano Allegri: è in finale di Coppa Italia" [Inter-Juve 3-0, but penalties reward Allegri: he's in the Coppa Italia final] (in Italian). La Gazzetta dello Sport. Retrieved 2 March 2016. ^ "Bonucci: 'Dedicated to my family'". Football Italia. 29 October 2016. Retrieved 29 November 2016. ^ "Bonucci: 'My son united the fans'". Football Italia. 7 November 2016. Retrieved 29 November 2016. ^ "Bonucci out for 45-60 days". Football Italia. 29 November 2016. Retrieved 29 November 2016. ^ "Bonucci extends contract until 2021". Juventus F.C. 19 December 2016. Retrieved 19 December 2016. ^ a b "Team of the Year 2016". UEFA.com. 5 January 2017. Retrieved 5 January 2017. ^ a b c "Gran Galà del calcio, la Juventus fa incetta di premi" (in Italian). Il Corriere della Sera. 31 January 2017. Retrieved 31 January 2017. ^ "Dybala at the double!". Juventus F.C. 17 February 2017. Retrieved 22 February 2017. ^ Ben Gladwell (21 February 2017). "Juventus' Leonardo Bonucci 'in stands' for Porto clash after Allegri row". ESPN FC. Retrieved 22 February 2017. ^ a b "UEFA Champions League Squad of the Season". UEFA.com. 5 June 2017. ^ "Official: Milan sign Bonucci". Football Italia. 14 July 2017. ^ "Grazie, Leo" (Press release). Juventus F.C. 14 July 2017. Retrieved 15 July 2017. ^ Ben Gladwell (10 August 2017). "Leonardo Bonucci the right player to captain AC Milan - Christian Abbiati". ESPN FC. Retrieved 11 January 2018. ^ "BONUCCI: "BEING CAPTAIN IS A HUGE RESPONSIBILITY"". A.C. Milan. 15 August 2017. Retrieved 11 January 2018. ^ a b "FIFA FIFPro World11". FIFA.com. Retrieved 23 October 2017. ^ "'AC Milan regret Bonucci signing'". www.calciomercato.com. 1 October 2017. Retrieved 11 January 2018. ^ Nima Tavallaey Roodsari (30 October 2017). "Where do AC Milan go from here?". www.calciomercato.com. Retrieved 11 January 2018. ^ Gaby McKay (28 November 2017). "Milan problems beyond Montella". Football Italia. Retrieved 11 January 2018. ^ "Bonucci Goal Puts Milan Over Crotone". www.beinsports.com. =beIN SPORTS USA. 6 January 2018. Retrieved 11 January 2018. ^ "Bonucci: 'I wasn't going to celebrate'". Football Italia. 31 March 2018. ^ "Agreements with Milan" (PDF) (Press release). Turin: Juventus F.C. 2 August 2018. Retrieved 3 August 2018. ^ "Official: Bonucci returns to Juventus". Football Italia. London: Tiro Media. 2 August 2018. Retrieved 3 August 2018. ^ "Chievo thriller on CR7 debut". Football Italia. 18 August 2018. ^ Gianluca Oddenino (18 August 2018). "La Juve soffre ma batte il Chievo, al Bentegodi decide Bernardeschi in rimonta" [Juve suffer but beat Chievo, Bernardeschi settles it at Bentegodi in comeback]. La Stampa (in Italian). Retrieved 18 August 2018. ^ "Bonucci: 'Juve reinforced'". Football Italia. 29 September 2018. ^ Paolo Menicucci (3 October 2010). "Juventus-Young Boys". UEFA.com. Retrieved 4 December 2018. ^ "UEFA Champions League - 2018/19 Season - Match press kits". UEFA.com. 17 October 2018. Retrieved 4 December 2018. ^ "Juventus teenage forward Kean racially abused at Cagliari". BBC Sport. 2 April 2019. Retrieved 3 April 2019. ^ "Bonucci: "The goal? It was tested in training."". www.juventus.com. 2 April 2019. Retrieved 4 April 2019. ^ Aimee Lewis (4 April 2019). "Leonardo Bonucci says he was 'too hasty' with Moise Kean racial abuse comments". CNN. Retrieved 4 April 2019. ^ "Comunicato Ufficiale n. 99: Gara amichevole Under 21 Serie B – A.C. Renate presso il campo Comunale "L. Fabbri" di Trezzano S/N (MI) – Viale Europa, 90" (PDF). Lega Calcio (2007–08 Archive) (in Italian). 2 November 2007. Archived from the original (PDF) on 18 February 2011. Retrieved 28 June 2010. ^ "Comunicato Ufficiale n. 127: Gara amichevole Under 21 Serie B – Under 20 Serie C presso stadio "G. Voltini" di Crema – ore 14:30" (PDF). Lega Calcio (2007–08 Archive) (in Italian). 30 November 2007. Archived from the original (PDF) on 18 February 2011. Retrieved 28 June 2010. ^ "Comunicato Ufficiale n. 69: Gara amichevole di allenamento a squadre contrapposte presso il campo Comunale "L. Fabbri" di Trezzano S/N (MI) – Viale Europa, 90" (PDF). Lega Calcio (2007–08 Archive) (in Italian). 5 October 2007. Archived from the original (PDF) on 18 February 2011. Retrieved 28 June 2010. ^ "La Top 11 Serie D Corriere dello Sport supera per 1 – 0 l'Under 20". Serie D News (in Italian). 31 May 2007. Archived from the original on 16 July 2011. Retrieved 25 July 2010. ^ "Nazionale in cifre: Bonucci, Leonardo" [National team in numbers: Bonucci, Leonardo]. figc.it/ (in Italian). Retrieved 27 April 2015. ^ "Amichevole Italia-Camerun. Tre le novità di Lippi: Sirigu, Bonucci e Cossu". FIGC (in Italian). 28 February 2010. Retrieved 2010-02-28. ^ "Italy: Borriello and three newcomers". Football Italia. 28 February 2010. Archived from the original on 3 March 2010. Retrieved 2010-02-28. ^ "Line-ups: Borriello and Cossu start". football-italia. 3 March 2010. Archived from the original on 10 March 2010. Retrieved 2010-03-03. ^ "Verso il Mondiale. Ventinove Azzurri convocati per lo stage di Roma". FIGC (in Italian). 2 May 2010. Retrieved 2010-05-02. ^ "World Cup 2010: Giuseppe Rossi left out of Italy squad". BBC Sport. 1 June 2010. Retrieved 2010-06-01. ^ "Domani penultimo collaudo: Azzurri in campo a Bruxelles contro il Messico". FIGC (in Italian). 2 June 2010. Retrieved 2010-06-02. ^ Maurizio Nicita (3 June 2010). "Non è ancora un'Italia Mondiale Il Messico ci dà due schiaffi" [It still isn't a World Class Italy Mexico gives us two slaps]. gazzetta.it (in Italian). La Gazzetta dello Sport. Retrieved 27 April 2015. ^ Paul Wilson (24 June 2010). "World Cup 2010: Italy exit as Slovakia turf out reigning champions". The Guardian. London. Retrieved 28 June 2012. ^ "ItalJuve, Euro 2012 statistics". juventus.com. 3 July 2012. ^ Alvaro Moretti (1 July 2012). "L'Italia crolla in finale. Spagna campione d'Europa" [Italy collapses in the final. Spain champions of Europe]. tuttosport.com (in Italian). Tuttosport. Archived from the original on 30 March 2015. Retrieved 27 April 2015. ^ "Spain 0 Italy 0". BBC Sport. 27 June 2013. Retrieved 28 June 2013. ^ "Buffon stars as Italy win shootout & bronze". FIFA.com. 30 June 2013. Archived from the original on 9 July 2014. Retrieved 30 June 2013. ^ Angelo Proietti (5 September 2014). "Amichevole Italia – Olanda, fascia di capitano per Leonardo Bonucci" [Friendly Italy - Holland, captain's armband for Leonardo Bonucci]. tusciaweb.eu (in Italian). Retrieved 27 April 2015. ^ Sam Wallace (13 June 2016). "Italy 2 Belgium 0, Euro 2016: Giaccherini and Pelle see off disjointed dark horses". The Telegraph. Retrieved 14 June 2016. ^ Rob Smyth (2 July 2016). "Germany 1-1 Italy". The Guardian. Retrieved 2 July 2016. ^ a b c d Blair Newman (16 March 2016). "Leonardo Bonucci: the man who handles attacks at Juventus and in Ferrari garages". The Guardian. Retrieved 14 April 2016. ^ a b c d e f Luca Persico (2 June 2014). "Italy's World Cup 23". Football Italia. Retrieved 2 February 2017. ^ "UFFICIALE: Bonucci e Martinez bianconeri. Spesi 27,5 milioni!" (in Italian). tuttomercatoweb.com. Retrieved 13 September 2014. ^ a b c d e Luca Cetta (11 February 2015). "Bonucci a Bianconeri leader". Football Italia. Retrieved 19 April 2016. ^ a b c John Molinaro (2 June 2016). "Will Italy regret snubbing Giovinco for Euro 2016?". sportsnet.ca. Retrieved 18 March 2017. ^ "Bonucci: "Vittoria importantissima"" [Bonucci: "A very important victory"] (in Italian). Juventus.com. 3 April 2014. Retrieved 15 October 2015. ^ a b Mario Sconcerti (23 November 2016). "Il volo di Bonucci e la classifica degli 8 migliori difensori italiani di sempre" (in Italian). Il Corriere della Sera. Retrieved 27 December 2016. ^ "I Campioni d'Italia: Leonardo Bonucci". Juventus.com. Retrieved 13 September 2014. ^ "Bonucci a Bianconeri leader". Football Italia. 11 February 2015. Retrieved 13 October 2015. ^ "FourFourTwo's Best 100 Football Players in the World 2015: 50-41". Four Four Two. 2 December 2015. Retrieved 7 January 2016. ^ ""Così l'ho trasformato in difensore"" (in Italian). Il Piccolo. 15 June 2016. Retrieved 3 September 2018. ^ Andrea Dipalo (29 April 2010). "Manchester City in vantaggio su Bonucci" (in Italian). Tutto Bari. Retrieved 3 September 2018. ^ Kris Voake (13 October 2012). "Bonucci and Barzagli struggles a big concern for both Italy and Juventus". Goal.com. Retrieved 19 April 2016. ^ ALBERTO GASPARRI (2 May 2015). "Bonucci, gol da sciacquarsi la bocca" (in Italian). /www.sportmediaset.mediaset.it. Retrieved 3 September 2018. ^ "Buffon: 'Bonucci most improved'". Football Italia. 3 June 2015. Retrieved 19 April 2016. ^ Gregor MacGregor (18 December 2015). "The 11 best defenders in the world". FourFourTwo. Retrieved 19 April 2016. ^ "Morata: I have to give more". Football España. 24 March 2016. Retrieved 19 April 2016. ^ "Galli: "Bonucci ha le qualità per essere il nuovo Scirea"" [Galli: "Bonucci has the skills to become the next Scirea"] (in Italian). Tutto Sport. 6 September 2010. Archived from the original on 15 January 2016. Retrieved 13 October 2015. ^ Federico Pisanu (26 December 2012). "Classifica 100 migliori calciatori del 2012 stilata dal The Guardian" (in Italian). The Guardian. Retrieved 15 October 2015. ^ Paolo Bandini (29 February 2016). "Leonardo Bonucci in the spotlight as Inter cannot stop remarkable Juventus". The Guardian. Retrieved 18 April 2016. ^ "Martina e Leondardo, congratulazioni" (in Italian). juventus.com. 18 June 2011. ^ "Lorenzo Bonucci has come to the world". juventus.com. 8 July 2012. ^ "Leonardo Bonucci, nato il secondo figlio del difensore: si chiama Matteo" (in Italian). Il Sussidiario. 14 May 2014. ^ "Bonucci vuole scrivere la storia della Juve" (in Italian). juventus.com. 17 April 2014. ^ "Leonardo Bonucci e Martina Maccari incinta, la famiglia meraviglia si allarga" (in Italian). Oggi. 17 December 2013. ^ "Fiocco rosa in casa Juventus: è nata Matilda Bonucci" (in Italian). tuttosport.com. 5 February 2019. ^ Sean Gibson (23 May 2017). "Juventus defender Bonucci's son cries during title celebrations - he supports rivals Torino". The Telegraph. Retrieved 15 July 2017. ^ Mike Lazar (30 July 2017). "Infant son of Juventus star undergoes emergency surgery". La Gazzetta dello Sport. Retrieved 15 July 2017. ^ Miguel Delaney (14 July 2017). "Wanted by Antonio Conte and Pep Guardiola why is AC Milan-bound Leo Bonucci snubbing the Premier League?". The Independent. Retrieved 15 July 2017. ^ Marco Gobattoni (16 January 2014). "Calcio, Riccardo Bonucci racconta Leo "Giocavo meglio io, ma guai a dirglielo"" (in Italian). Il Messaggero. Retrieved 15 July 2017. ^ "Lazio captain arrested in match-fixing investigation". BBC Sport. 28 May 2012. Retrieved 15 July 2017. ^ Brian Homewood; Gavin Jones; Ed Osmond; Steve Scherer (3 August 2012). "Bonucci could face three-and-a-half year ban". Reuters. Retrieved 15 July 2017. ^ "Juventus' Antonio Conte gets 10-month ban in connection with match-fixing". The Guardian. 10 August 2012. Retrieved 15 July 2017. ^ Bandini, Paolo (21 October 2012). "Napoli wilt in the face of Juve's Andrea Pirlo facts". The Guardian. London. ^ "Leonardo Bonucci". National Football Teams. Benjamin Strack-Zimmerman. ^ a b "Leonardo Bonucci – Convocazioni e presenze in campo". Italian Football Federation (in Italian). Retrieved 28 June 2016. ^ "INTER BEAT MILAN TO LIFT PRIMAVERA CUP". inter.it. 5 April 2006. Retrieved 14 December 2015. ^ "UEFA Europa League squad of the season". UEFA.com. 3 June 2014. Retrieved 3 June 2014. Wikimedia Commons has media related to Leonardo Bonucci.